It's hard to believe that I'll be leaving for Aiken tomorrow! Thanks to some wonderful and awesome people, our Kickstarter was an amazing success. I'll be thanking all of you here on the blog soon, and we'll be sending gifts from the road as we go. I'm really excited to be able to carve out a small fund to get this book going. You never know what will happen when you set about to create something, at least I don't. I often have a rough idea. Sometimes, I even have a plan, but who knows if the end will be anything like what's envisioned at the beginning? It's kind of like a road trip (Ha, ha, wow, what a creative analogy!). There's a route, okay, but the story might be centered in its deviation. At the moment, I have some essays in mind. For instance, I'll be writing a piece on cemeteries, also known as America's early parks. Last week, I hiked up to Mountain View Cemetery in Oakland to take photos and think. It was actually designed by Fredrick Law Olmsted, the person who designed Central Park in New York. 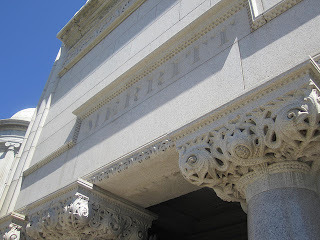 That's me, hanging out at hallowed tomb of Mr. Samuel Merritt. Hey dude, totally, sincerely, thanks for the lake and the college and stuff! I'm also working on a piece about "The Section" and public art. Did you know that the Treasury Department used to award commissions to artists to create public art? Back in the 30's it was understood that artists were workers like everyone else. That's pretty cool, eh? I'll get there and to it! But for now, expect more but shorter updates from the road. sorry I was not one to support (I had this massive move and I was out of the loop). Good thoughts of great weather and cool, fun times to be guaranteed and art and journaling, I wager moving forward. People in Boston lunch in public parks (and I used to, when I lived in Boston).